The Star Wars Documentaries (some call them movies) were light on the details of how to order the famous DL-44 Blaster Pistol from Blastech so this cardboard creation is our attempt at recreating Han Solo’s trusty sidearm. 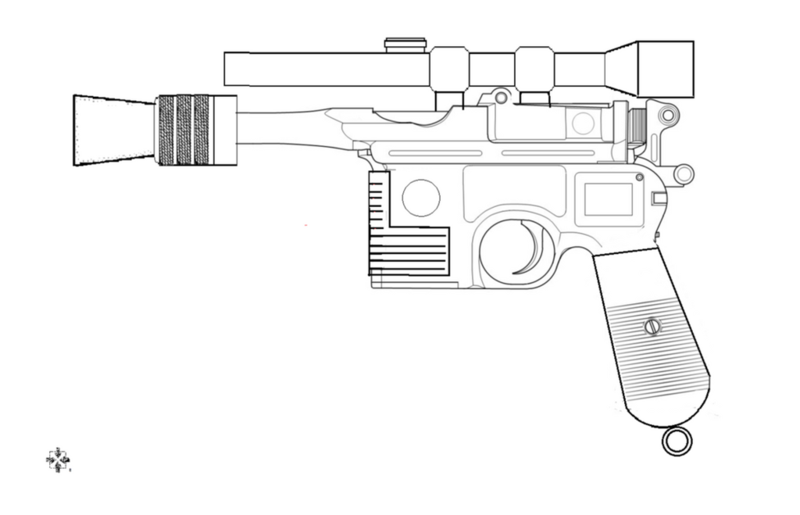 We tried to keep it as real and to scale as much as possible so we started with a great line schematic of the blaster that I found here. We printed out several copies of this line drawing so that we could use different parts as patterns during the build. As you can see by the print, the real blaster is 12” long and normal printer paper is 11” so I scaled up the schematic and cut off the end of the barrel to maintain the proper scale. After cutting out the basic shape of the blaster from the print, we traced it onto some very thick cardboard that we found…..yes, we found itin the garbage. Construction site garbage bins are a great place to find cardboard 🙂 If you cannot get cardboard this thick, just cut out 3 to 4 layers of basic corrugated cardboard and glue them together. A regular box cutter is unable to cut through such thick cardboard, so we used our bandsaw. We used our scroll saw to cut out the trigger guard because a scroll saw allows you to get a blade into the middle of a piece without cutting your way there. Just drill a hole and then feed the blade through the hole. Love our Dewalt deep scroll saw. Once the solid base of the blaster was cut out, we could start to add the details using the extra line prints as templates. We keep a good stock of cardboard (some of us would say its a large pile that needs to be recycled and others would say its a giant pile of potential) handy for different types of projects. This thin version has a very tight corrugated layer to it vs a simple flat cardboard like a cereal box. To make the ribs for the heat sink on the front of the blaster, we stripped up some cereal box with a box cutter along the edge of a metal ruler. We cut all of our projects out on a large piece of Corian – the countertop stuff that is made to look like marble. It does not flex and does not dull the blade too quickly. Corian can also be found in construction work site garbage bins. To create the authentic “broom handle” grip on the blaster, we built up the inside as shown below and then curved a piece of that same thin corrugated cardboard over the top. To make the cool grip lines, use a flathead screwdriver and run it across some of the corrugated lines to break through. Obviously, this means that you need to cut the handle piece of cardboard with the corrugated lines running horizontal. Looking pretty good at this point. We used hot glue for most of the build with some white glue as well when a very thin glue was needed. Just finished the other side before we could add the small strips we cut earlier for the heat sink. To create the appearance of the barrel running along the top section of the blaster, we found a cardboard rod that was apparently part of a dry cleaning pant hanger. It was the perfect circumference. The only problem was that it was white so we covered it with some paper bag to keep the generally brown color consistent. To add the ribs to the power pack heat sink, we quickly applied a small dot of hot glue and attached them to one side of the blaster. Once they were attached to the other side and trimmed for length we encased the small cardboard strips in a thin layer of white glue for added strength and protection. In this picture I spread out the bottom part already. The glue dries clear so I ended up adding more layer until I felt the little strips were secure. On to the scope! According to the line drawing we needed a tube with a circumference that we did not own. It needed to be thicker that the hangar tube we used earlier. To make the tube thicker we simply rolled more paper bag around the tube until it was the correct circumference. For the cone shaped section we built our own cone out of non-corrugated thin cardboard. NOTE – when rolling the cone worry more about the angle of the cone than the overall length. Once the hot glue cools you can cut the cone down to the right length. At the bottom of this picture you can see the scope mount. We did not like the blue and white edge of the thin corrugated cardboard that we have been using so we added a thin layer of paper bag to cover the inside of the scope mount. Once the glue dried we trimmed off the extra. In most cases is it much easier to attach a piece and then trim it to the exact size afterwards with a new box cutter blade. This is a close up of the top of the scope mount. We have included this picture to show you how we use the actual piece as the template for the next piece – especially later in the build. All good builds never really go according to plan. Remember – no one will see your template and compare it to your finished work. The finished work has a better chance of working as a whole if you use the actual piece for your template. In order to blend the barrel with the main part of the blaster we carved out the middle section of the blaster base as shown below. The blaster barrel is not cut down to length yet but you can see how the blend will work. This is the bottom side of the barrel that was all glued down with hot glue. NOTE – We use a dual temp hot glue gun that allows us more time to smooth out the glue to a thinner layer when used on the hottest setting. The cooler setting allows you to set a piece quicker without as many burns along the way. Getting so much closer. We have the rail attached for the scope mount to attach to. The scope is on! Now onto the barrel. This first section is just in place for fit but is not glued yet. Using the same cone making technique that we employed when making the scope we now create the end of the blaster barrel. Using a section of tube as a guide we can better draw a line around the cone. This allows us to make sure that the end of the barrel is square to the blaster. Nothing destroys credibility of a cardboard blaster than a non-squared edge to the end of the barrel. We loved the angles on the cone for the end of the barrel but the cone was not thick enough. We just added a second layer to add thickness. Placing a hole in the end of the barrel allowed us to keep the thick section of the barrel true to the center of the barrel. After drilling holes on our drill press and attaching it all to the barrel the major parts of the build are in place. The only thing left is the small details around the barrel and the scope adjustment nob on the top of the scope. Once the trigger is added feel free to make the appropriate PEW PEW PEW sound as you imagine plunking some stormtroopers.